"JMG have expertathletic coaches, who are warm, friendly, talented and proficient with students of all ages. Their knowledge of fundamentals, as well as their emphasis on sportsmanship and teamwork improve the skill levels in all our young athletes, as well as encourage a healthy self-esteem. Their sports clinics are joyful and engaging. Above all, JMG enhances the community of our school, and city, by bringing together the students of our various schools through sports. Our school spirit is high and we have young, confident athletes. Thank you JMG!" "Coach Tony and Coach Matthew provided a perfect environment for Grant and Grace to explore, understand and eventually embrace soccer; each at their own pace and passion. Grace enjoys recreational play and Grant found a true calling in soccer and now plays on a competitive travel team. And even with his current expert coaching he still learns (and loves) his 1-1 time with his very first coaches!" I would like to recommend Matthew Wong, the founder of JMG SoccerWise for our school. Coach Matthew has been wonderful with my boys Joseph and Matthew since they have been in St. James Preschool. Throughout the last 3 years he patiently and diligently coached my boys every week in school and on weekends, and the boys grew from not wanting to particulate at all to now really loving soccer. Their confidence and skill set have increased dramatically and I think Coach Matthew and his colleagues are the reasons for the success. I believe there are other parents like me in Broadway who would really love having our kids to have the opportunity for this wonderful additional program (which is not in competition with our existing ones). Please find more information below. Feel free to contact Coach Matthew or myself if you have any questions." "I wanted to share some info about a fantastic soccer program called JMG SoccerWise that all 3 of my children have been a part of, and see if we might be able to implement it at Third Street. JMG Soccer is run by Coach Matthew. Both he and all of his staff are absolutely terrific! My kids have loved this program since preschool and as a parent, I love that it not only teaches great soccer & athletic skills, but also builds good sportsmanship and character both on and off the field. Coach Matthew has implemented soccer programs at my daughter Satine's previous three schools (St. James' preschool, CLIC charter school, and St. James' Elementary), but he has programs at various schools all over town. My two youngest (4 and 2 yr old.) have also taken weekend programs with him, so I can personally vouch for how great the program is at working with kids at all ages and skill levels." "The classes are going fantastic. Kids along with instructors are very enthusiastic about the program, to the point where the students are coming in all geared up, wearing their favorite soccer jerseys and indoor soccer shoes. The program begun with a basic introduction to soccer skills and it has progressed over to more advanced techniques geared towards having an actual soccer game. We are not quite there yet, but will be at that level soon. In these two weeks that have passed, we have noticed a significant amount of progress, participation and motivation spread all across the site. We definitely foresee a positive outcome, that is, BMI reduction in every child’s record, more parent involvement, and more importantly, maintenance of these patterns of physical activity during childhood, adolescence and throughout each student’s life span. 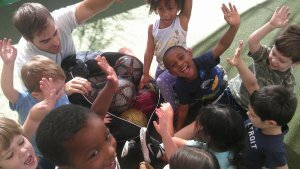 Over all, this program will significantly contribute to our students well-being, that is: Instilling good health, development of fundamental and advanced motor skills, improving student’s self-confidence, and providing an opportunity for increased levels of physical fitness, which are directly interrelated with high academic achievement. Thank you very much for giving the kids in our program the chance to experience such valuable learning experience." 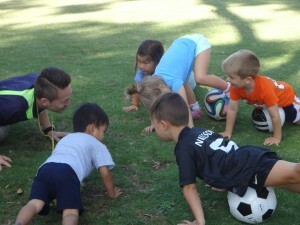 "Zadie has been taking soccer classes with Coach Matthew since she was 3. I've seen her really develop a lot of healthy social skills and in her overall focus and coordination. Zadie looks forward to soccer each Sunday! Coach Matthew has built school soccer programs for many years and is putting together an elementary school league in our local area." "We enrolled our son in a multi-sport program that Coach Kat taught. Our son does not usually enjoy any kind of sport, but he actually loved the class and he loved Coach Kat too. We are grateful to her for finding fun ways to engage our son and teach him." "I am impressed with the quality of instruction from you and your team. It is hands down the best soccer instruction that Tripp has ever had. Hope to get Tripp back in later this year."